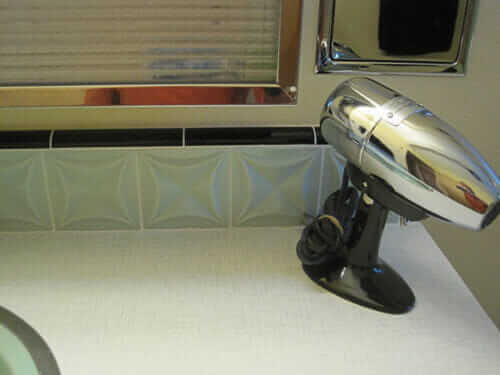 Following up on last week’s story about the beautiful dimensional tile in Cody’s bathroom, my hypothesis on the tile’s maker was proven wrong by reader Jeff, who has identified the tile. He has photos showing proof marks: They are Franciscan Hermosa Tile and even more specifically, the company’s Contours line. That’s Jeff’s bathroom vanity above — he has the same tile in his bathroom as Cody. In this story, I also tease apart company brands: Gladding McBean… Franciscan… Hermosa… and Interpace — all conglomerated by the early 1960s, it seems. Hi Pam. The dimensional tiles look like some Franciscan Hermosa/Gladding McBean tiles that we have used. See attached photos. I *think* that I have an unused spare. If it’s useful, I can find it and photograph the back. 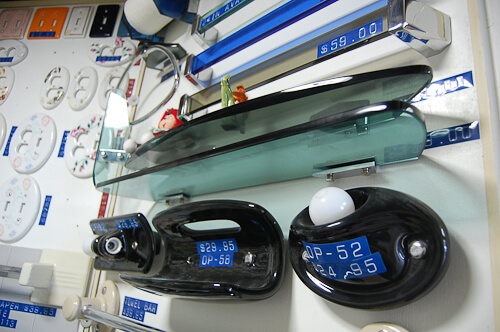 Above: And indeed, Jeff found the spare and sent us a photo of markings on the back. Thank you, Jeff! Here are the blue M-Bs. All of the info is from the back of a single tile (and appears on each tile). The dimensional tiles certainly are fun. And to further add to the identification story, Cody sent me the photo above with yet another design dimensional tile in his 1964 bathroom. He calls it his “birdwing” design. 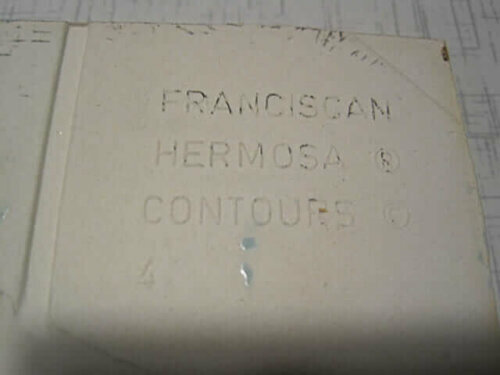 I found this exact tile for sale on ebay and its markings on the back indeed say Franciscan Hermosa Contours. 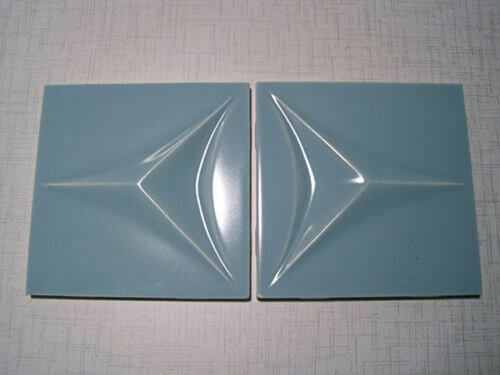 Digging around an hour or two on the internet, best I can piece together is that “Contours” was the name of a line of dimensional aka sculptural tiles available from various related tile brands — Gladding McBean, Hermosa Tile, Franciscan Tile, and Interpace. This wiki-type (I think) history starting with Franciscan Ceramics seems to lay out the corporate associations. The story says that Contours was its own distinct brand or line of tile. 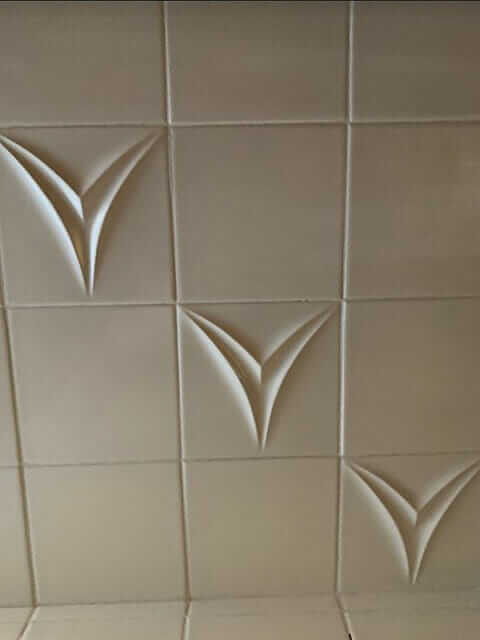 Finally: Even though I/we still can’t find markings to 100% verify that the tiles in both Cody and Jeff’s bathrooms are from this same Contours line, I’ll bet my bonus they are, since they were found in the same home with other tiles from the same line. So, thus declared: Mystery solved! And, now I have a better understanding of the how these tile brands were related. Thanks, Cody and Jeff, for launching me down this (lovely tiled) rabbit hole! 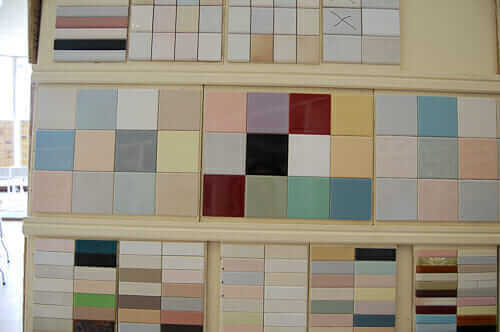 All of our stories about Franciscan Tile. All of our stories about Gladding McBean Tile. …. And, I try to archive all my bathroom tile stories here. Pam, my Dad was a carpenter and when the “old barn” fell down we found boxes of left over tiles from different projects he did in the 60’s and 70’s. 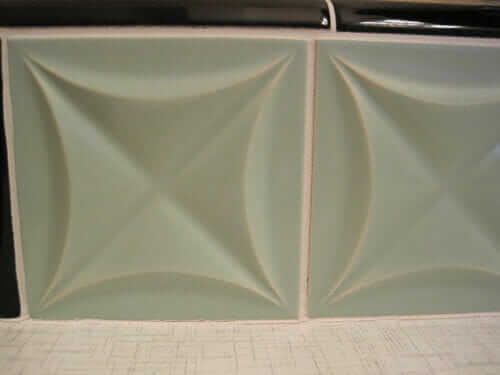 My favorite are a dozen spring green (light avocado green) tiles with cream colored damask pattern from Crown tile company. I have looked all over the interweb and alas have found nothing about Crown tile. 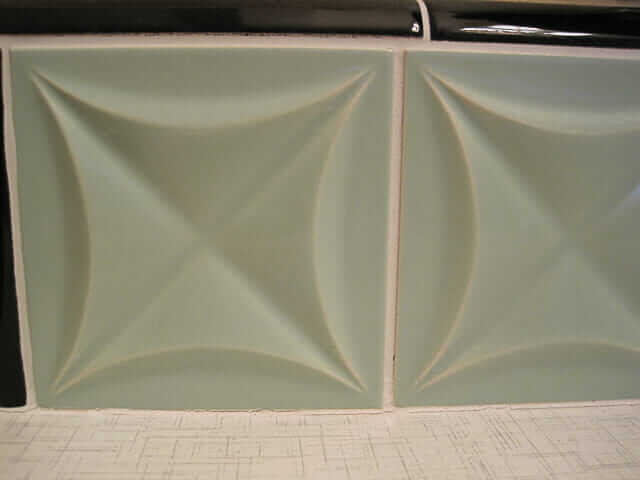 Have you ever in your research heard of Crown tile and if so, please send me the link to what you found. I’m saving the little gems for someday when I own my own house and can redo as I please. Hi Sarah, I have not heard of this brand. 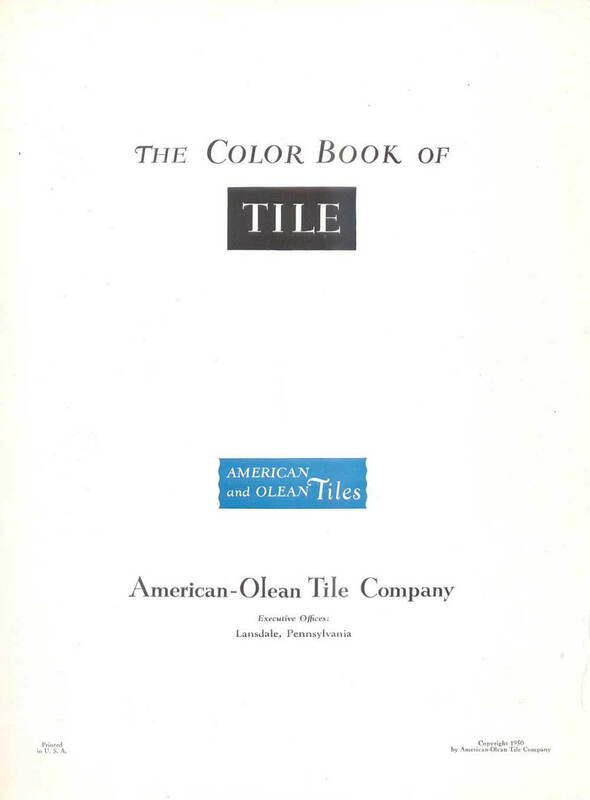 Back in the day, there were lots more tile companies, I think — regionally and locally. Very cool find!